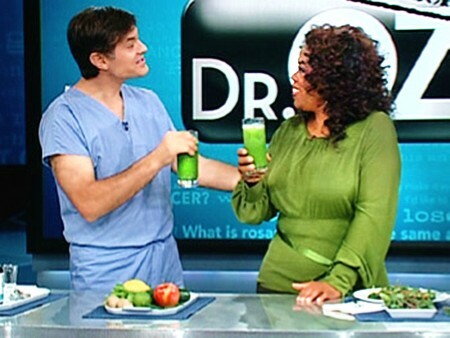 If you watch Oprah (and who doesnt), then I know youre familiar with Dr. Mehmet Oz and his famous green drink. Dr. Oz says he drinks it just about every morning and if you look at Oprahs weekly meal plan, youll see that she too is drinking it every morning. Me too Me too!! Yummo! After everything is combined in a blender (I highly recommend Vita-mix), this recipe makes 28 to 30 ounces — about three to four servings. After Oprah tried this on the show, she was pleasantly surprised and exclaimed Its a glass of fresh! If youre not used to green drinks, you may find them a bit earthy in the beginning. An easy solution is to increase the fruit content until you get used to the earthy taste. I betcha one day youll be craving green drinks just like Dr. Ozs recipe (I do). But in the beginning (and for as long as you want), feel free to increase the apple, or add a banana, or add in my favorite fresh mango or cooked sweet potato! This isnt a race, its a lifestyle. If you know me at all, you know there is one kitchen appliance I am passionate about my Vita-mix blender! Yes, its at the top of my Couldnt Live Without list and yes, youre going to see a plug for it on every smoothie recipe I write because using a Vita-mix blender gives your smoothies much more nutritional value than any ordinary blender possibly can! And because I care about YOUR health! Heres the skinny Vita-Mix processing breaks open the cell walls to release maximum nutrition from whole foods, more than you can get any other way. Vita-mix gives you everything youd want from a blender and more! No question about it the Vita-Mix blender is superior to anything else on the market and well worth the investment! To learn more about Vita-Mix or to get your coupon code for FREE SHIPPING please visit my Vita-Mix page. What about you? Do you enjoy your green drinks? How often do you drink them? Heres to Peace, Love, and Lovin Our Greens! 55 Comments on "Dr. Ozs Green Drink"
How about you just eat the apples, celery, ginger, and spinach? Some people have issues with textures. I cant eat most whole fruits and vegetables because their textures make me gag. Some people dont have a lot of time in the morning to munch away at all of that and there is the issue of getting full before you can eat everything that you need to eat to get the proper amount of nutrients. Im just saying, that unless you have that time and dont have sensory issues (like me), eating the whole fruits and veggies isnot worth it. I am a diabetic, with kidney failure and have to watch my phofates and sodium. I have a real problem in having high numbers and tend to gain 10 pounts in between my one day on and one day off dialysis. Can you halp me in some recipies? Also I wonder if you juice one meal or two meal with one regular meal?? How does that work? HELP I am in the process of making Dr Ozs green drink smoothie and I cant seem to puree the ingredients. I have half a blender full w/all the juices (lemon and lime) and it only purees the very bottom of it. Im going to try to process smaller amounts at a time, but I dont think there is enough liquid to process all the ingredients into 3-4 smoothies. Please e-mail me asap. I dont want to waste all the ingredients I just got for this drink. Thank you in advance for your quick response. From 280lbs to 178 . With no exersizeing. My cholestra went from almost 10 to 4.7. I quit all dibeteus meds. My skin cleared up my blood pressure went from real high now its normal stopped the meds for that also. Also no more leaky bowell problems. You will thank me. STOP ALL WHEAT PRODUCTS NOW. The book wheat tell you why. Fred, Congrats on your success and for sharing it with out community. I couldnt agree with you more about the blessings of a Vitamix! Hi Jolene, Youll want to drink about 8 ounces at a time. The recipe makes 3 to 4 servings. Yes, I eat normal meals and consider the green drink a between meal refresher. Id add the lime next time. Limes rescued British sailors from scurvy and they can rescue you from any vitamin C deficiency as well as acidosis (too much acid in the body). Limes are wonderful alkaline-forming fruits in the body because of their near zilch sugar content and ultra high mineral content, making them the ideal companion for a health-minded soul. hi, If i wasnt able to finish it that day, can i save it for the next day? I used a juicer to make Dr. Ozs Green Drink. I halved the recipe, with the exception of the lime, and lemon. It is tart, which I like (drinking it now for the first time). I find it quite palatable and refreshing. Id definitely give this juice an A+. Great information. Thank you so much for your service. Can I make the drink in bulk? How long does it stay fresh? Hi Kristin, you can make it in bulk, but I wouldnt make more than you can drink in a day. The longer it sits, the more vitamins and nutrients it loses. What is the name of the machine that Dr. Oz used to turn frozen berries and a banana into ice cream? Where can I purchase one? I believe Dr Oz is using a Vitamix. Its the best blender Ive found to do exactly what youre asking about and so much more. If youre interested, you can find more about it here and you can also get a discount code for free shipping. I was looking for the Eye Protecting Mango Dream Smoothie, but the page cannot be found. How can I get this recipe? I need help with my eyes. Also, how can I order the Vitamix? Hope to hear from some one. Hi MaryAnn, Heres the link to the Eye Protecting Mango Smoothie. I sincerely hope that helps you! If you use this Vitamix Discount Code, youll receive FREE SHIPPING on your VitaMix order. Best of success to you, Mary Ann, as you heal your body the natural way. Regarding Dr. Ozs Green Drink. What about the whole issue of food combining? According to those who subscribe to this principle, you shouldnt eat fruit and vegetables together. The apparently require different digestive enzymes/juices to break down and can create a lot of gas and putrifaction when eaten together. Thanks in advance for your reply! Hi Fiona, Im still on the fence about that. I know of people who say its all rubbish and then there are those who swear by it. I think the only thing you can really do is see how YOUR body is affected by combining. These days Im leaning more towards the idea of combining but I still drink my smoothies with mixed fruits and veggies. Obviously, Dr. Oz doesnt pay any attention to food combining and he seems to lean very much toward naturopathic medicine, so I tend to trust him quite a bit. This is great! Green Smoothies are very heatlhy and are a great way to get vitamins and minerals and antioxidants!!! Go Smoothies! I make a fruit/veggie smoothie about 4 days a week (can also speak highly about Vitamix wonderful!) and just started putting chia seed gel in for my liquid instead of water or other juices. Any thoughts on that? And thanks to Kelly commenting that you shouldnt eat spinach every day due to kidney stones. I currently do eat the stuff almost every day (in smoothies or just eat it whole because I love it) so Ill have to make some attempts to get out of my spinach rut. Read the problems..this poster forgot to mention dr oz uses water! Thats why it wont blend people. I think it might depend on your blender. I use a Vitamix and I blend it without any problem without added water. On Dr. Ozs website, I dont see the addition of water, but perhaps he used water on his show. If yours isnt blending properly, for sure add enough water to make it work. which is known to create weight loss and its DE-LISH-OUSSSSS!! Give it a try and let me know what you think. Awesome advice rcollen! Thanks for sharing. I love Dr. Oz. He has some great diet suggestions especially his smoothie recipes that are full of fiber and nutrients. Smoothies are great meal replacement meals that will keep you full and satisfied. Buy the book wheat belly and get a vitamix. It may save your life. I was wondering if I could make this smoothie and then put it in an ice cream maker to help reserve it for later use. Do you think this recipe would freeze better with yogurt? I was also wondering how well it would freeze because I want to give my kids a healthy frozen treat. I am pretty used to the earthy taste of drinks like this by now, because about 4 years ago I changed my diet completely, and now my diet consists mainly of fruits and veggies. I used to hate the taste of veggies, but now, its the stuff I crave. Dr. Ozs green drink tastes GREAT, and Im not just saying that because its made of the stuff I crave. I think it would taste good for anyone, and I had to find the recipe! What is a good green drink recipe for type 2 diabetes? I am a 63 year old male. I also need to lose about 40 pounds. T.I.A. Ive been making this for years. Delicious!